I had a great summer. It rained so much in July I started to get moldy. Then August and the sun arrived together and the world brightened. 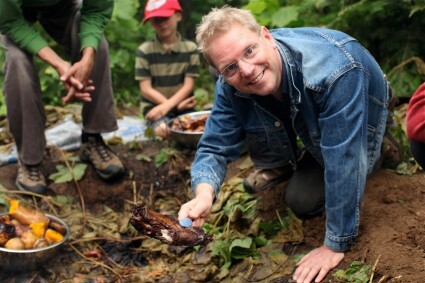 My wife and I sent to our daughters to Stone Age Camp with Chris Morasky and at the the end of camp, he had a big feast that the kids helped prepare. This is a piece of racoon that I scooped out of the pit oven. It had an oaky flavour with a hint of rodent. My family spent time at our cabin in southern British Columbia. 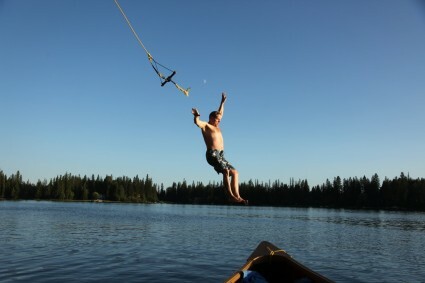 Here's a photo of me just before I fell in the water. I only let go because I couldn't hold on any longer. After that, it was off to the Lady of the Lake family music and dance camp on Lake Coeur D’alene in Idaho. We have been going there for the last 6 years and we love it. 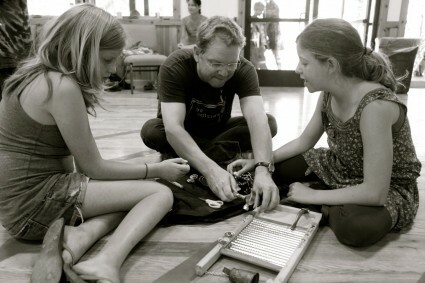 My daughters Ella and Amy are working on our musical washboard project that we made in camp. 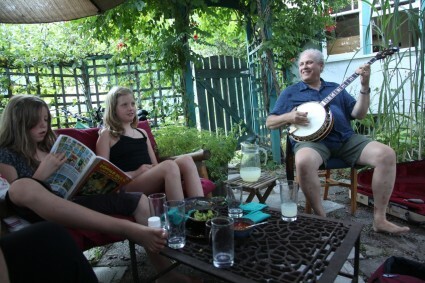 When camp ended, we raced home and had a wonderful day in our back yard with one of my musical heroes, Pete Wernick and his wife Joan. We had a nice supper together and Pete taught Amy a new verse to Old Joe Clark. Amy loved it because it tells how a teacher blows her nose in the cornbread and calls it pumpkin pie. 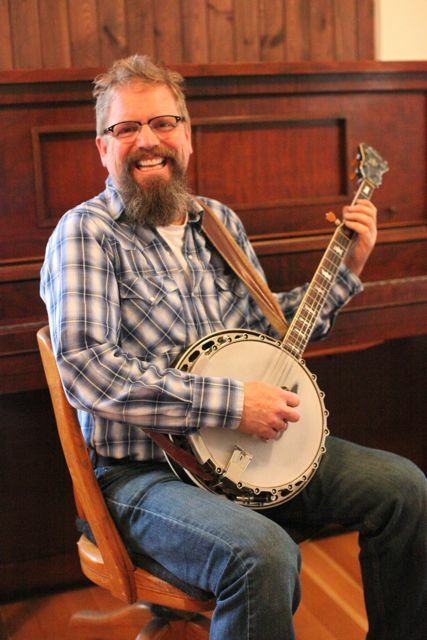 I first met Pete in 1988 when I went to the Telluride Bluegrass festival and took a week of banjo instruction from Bela Fleck at the Telluride Bluegrass Academy. Even though there was space for 15 students, only 7 registered for Bela’s class. Go figure? It was a rare opportunity to learn from one of the greatest musicians. He was a very nice guy to boot. 4 years later, I went to one of Pete’s banjo workshops in Nashville. I didn’t have a car so Pete would pick me up at the hotel in the morning and drive me out to the nunnary where the class was held. I really got to see what a wonderful person he is and listening to him tell some great stories on those drives was a highlight for me. 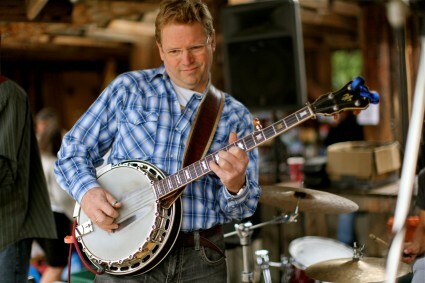 Here’s a video Pete playing banjo in his fantastic band, Hot Rize. After the summer ended, it was back to work, buying, selling, flipping, fixing and playing. 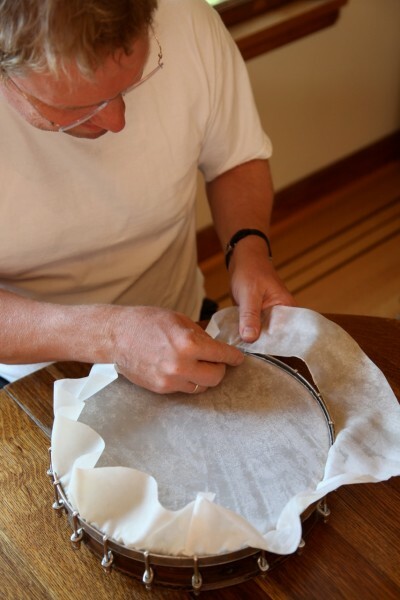 This is a photo of me putting a new skin head on a Fairbanks and Cole banjo from 1882 that I’m restoring for someone here in Nelson. I’m trimming the excess skin from the head, just like a plastic surgeon. On Saturday I played a couple of shows here in Nelson with a great young band of guys called Locomotive Ghost. This is from the Cottonwood market Saturday afternoon. 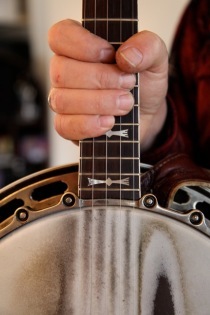 That’s my wonderful old Gibson top tension banjo from 1942. 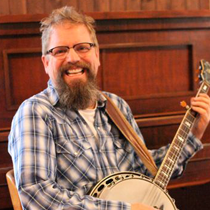 Rockin' it out, banjo style. Hmm – that Lady of the Lake camp sounds very interesting! Who is it put on by? We have a 10-year-old daughter and and 18-year-old daughter. Do you think it would work for both? They both play music – I think we’d have a great time! Sounds great! I’ll check it out. We usually drag our youngest daughter along to Bluewaters outside of Spokane, but I think she’ll like this better!